We're now six months into 2007 and there have been a lot of news about new anime publications hitting retailers. From Isaac Alexander comes a brief overview of news from last year from where the last report  left off. One addendum to the previous report : The report neglected to include two new publications that were starting at the end of 2005. The Monash Caulfield Anime Club in August 2005 premiered their first issue of Animaverick , Australia's first homegrown anime magazine covering anime, manga, and J-pop in the land down under. Across the Indian Ocean west of Australia, the company Xvolve Publishing premiered the first South African publication called Otaku Magazine . As of this time, both publications are only available in their host nations. Jumping to the present day, but back across the Indian Ocean, Singapore saw an anime magazine fold, and another one premier. The company behind the magazine M.A.G.E. chose to end the publication in late 2006 to focus more on its retail operation. This past spring, Orgnix Studios stepped up to fill the void by publishing Fresh Mode , which previews manga from local Singapore creators in each issue. The magazine also covers anime, manga, and J-Pop from Japan. Free publications devoted toward anime and manga seems to be the new trend, as there are now four of them in North America. Animerica  continues to be distributed in Borders/Walden Bookstores in North America while Tokyopop Manga Magazine  is available through mail and at conventions. One of the new publications that came out in 2006 was Janime . Its layout is that of a free community newspaper you would find at your local grocery store or library, but with content about anime and J-pop news from Japan. The other unique thing about this publication is that it's distributed solely at anime conventions and festivals across North America. In spring of 2007, the company behind Janime began publishing a free sister monthly magazine called PopJNeo . This publication will also be released for free at anime conventions. In the U.K. Neo Magazine  continues to be the vanguard of anime and Japanese Entertainment for the nation. Anime Insider and Newtype USA  continue to be the largest circulated magazines in North America. Beckett Anime continues its niche of covering anime for a younger demographic as well as anime card games. The anime toy retailer Super 7 carries on with its magazine of the same name. 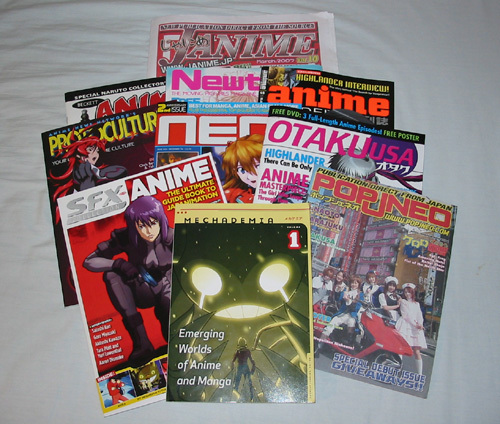 The magazine ProtoCulture Addicts , which is now full-color, continues to grow and expand as a result of it being purchased by Anime News Network. Mechademia 's inaugural issue came out right before Christmas of 2006. The journal is published more like a soft-cover book, and the people behind the magazine are already accepting submissions for their third issue. Otaku USA  magazine premiered in June from Sovereign Media. The Editor-in-chief, Patrick Macias, who has written books on anime, is leading this new bi-monthly magazine. The amount of extras included with this publication (DVD, Poster) puts it in the price range just below that of Newtype USA. Science fiction magazine SFX Collection  of the U.K. released a special issue devoted to anime in 2006. The special issue covered various anime titles that have come out through the years, as well as numerous articles and interviews of Studio Ghibli. In January 2007, 3D World Magazine  also released in the U.K. a special issue on anime. The issue contained an article on how to create anime-hair as well as a feature on Studio Ghibli's newest titles. Beside the anime-devoted publications above, there are other magazines that either regularly include anime/manga stories and reviews, or a special issue devoted to the subject. Here are some examples: Animation Magazine , Giant Robot , Play Magazine , Rocket Magazine , Scifi Magazine , Super 7 , The Comics Journal , & Wizard . The magazine Frames Per Second  (a.k.a. fps) has also had regular anime coverage. The publication switched from a print to a online publishing format (PDF) in 2005. Diamond Comics Previews  continued its March roundup of manga and manhwa publishers and their catalogues. ICV2  has their quarterly magazine devoted towards pointing out what type of otaku merchandise retailers should look out for. Kidscreen magazine  covers the business side of entertainment and covers licensing announcements and issues. All prices are in U.S. Dollars unless noted. Animaverick Magazine is in Australian Dollars. Fresh Mode is in Singapore Dollars. ??? - Euro. R ??? South African Dollar. The publications Janime and PopJNeo are distributed free at anime conventions and festivals in North America. Animerica is distributed solely at Borders/Walden Bookstores while Tokyopop Manga Magazine is distributed at conventions and through postal mail delivery. Submitted by Anonymous (not verified) on Mon, 2007-06-04 19:31. You left out a couple of Magazines in Australia. JAMWAF - Published by Jon Hayward of Anime News Network Australia, a more club specific magazine but has original articles. ANIME UPDATE - Produced by Madman Entertainment, Australia's biggest anime distributor. They produce this once every 3 months and have already racked up 12 issues. It is a free magazine that is given away instores, inside DVDs and at their booth at anime conventions and inside the show's showbag. Submitted by Isaac Alexander (not verified) on Mon, 2007-06-04 21:20. Thanks for pointing those two publications out. The about us page on JAMWAF doesn't have information I need to plug into the database, other then it's published three times a year. When was it founded and how many issues have been published? Is there a better webpage for Anime Update? I can't find any background information on it that I could plug into the spreadsheet I have above. If you could assist me with information about it, I would be most appreciative. Submitted by sephiroth on Tue, 2007-06-05 06:22. Questor (2000-2003; resurfaced 2004) = the Philippines' 1st anime magazine under the local anime distribution company, Telesuccess. It folded out of scene around 2003 and the rights was bought by a major publishing company ABS-CBN Publishing and resurfaced around 2004 but went out of the market after a few months and a few released issues. Otakuzine (2005-present) = a new anime magazine in place of the defunct Questor which is managed by the some of the Questor staff. Otakuzine is published by PSICOM publishing, the company who holds the rights to reprint DC Comics for the local market. Now PSICOM publishing are now publishing the Philippine's 1st cosplay magazine. Submitted by Isaac Alexander (not verified) on Tue, 2007-06-05 08:05. Thanks for the information about Otakuzine and Questor! I was wondering if you could provide me more information about these two publications that I could not find on their websites? Submitted by Anonymous (not verified) on Tue, 2007-06-05 08:21. In regards of Anime Update and Jamwaf, I think there is a bit of wrong interpretation as what we called as "proper" anime magazine. Anime Update, is not a magazine published by Madman, instead it is a product catalogue which is produced limited and only contain Madman's product there. Jamwaf in the other hand also not a proper anime magazine in Australia instead it is only a club-zine, ever since that they are covering only bits and pieces of anime review from random sources which doesn;t have any license in putting any pictures of any anime series in their magz. Hence, as you can notice, the magz doesnt even have any background information on their site and run only for fun. As far as I know, Animavericks Magazine is the only proper anime magazine that does come out quarterly a year with appear in many anime and games conventions to promote themselves, such as in Melbourne, Sydney and Brisbane. Submitted by Isaac Alexander (not verified) on Tue, 2007-06-05 18:40. Thanks for the clarification on the other publications out of Australia. Product catalogs would not be listed in the article. Company catalogs are company catalogs. In the USA, the Right Stuf Catalog is a popular annual print title for the company as it describes all the anime series that the online retailer sells. Good info on Jamwaf. Nice to have the perspective. Submitted by N_ (not verified) on Sun, 2007-06-10 00:52. Great article! The first issue of Otaku USA is very good, hopefully they can keep up the good work. Submitted by Isaac Alexander (not verified) on Mon, 2007-06-11 10:03. The first time I did this type of article, I included anthologies. However, I chose to split them for now on. I do plan to do an anthologies article, but not until Yen Press releases their new anthology in North America. They've stated that it will be released roughly between Dec07-Feb08. So, watch the site during that time and you'll see something similar. Submitted by N_ (not verified) on Mon, 2007-06-11 20:25. Ah I see! Can wait to see it! Submitted by Isaac Alexander (not verified) on Tue, 2007-06-12 12:27. I found another print magazine at my local Borders Bookstore. I can't find what year it was founded. Can anyone help me with this? No CD, manga insert, nor posters. Also, the website Animation World Network has published anime coverage in their monthly webzine. Submitted by Isaac Alexander (not verified) on Tue, 2007-06-12 14:39. Here's some links to sites that have coverage of english anime magazines. Here's just a quick list of past English anime magazines that are now defunct. Also, there's been some web zines in the past that have done lots of anime and manga coverage. Submitted by AJ Kock (not verified) on Tue, 2008-06-03 03:01. The South African currency is Rand, not South African Dollar. Submitted by Thien (not verified) on Wed, 2007-06-20 02:37. If this email goes to a wrong address, pls foward it to the person in charge of simply ignore it. I am Thien, working in the Rights Promotions Department of the Education Publishing House in Vietnam. I am interested in your manga books and hope that you could show me the way how to have a contact with the responsible persons who are in charge of granting the translation copy right. Any of your advise would be highly appreciated. I am looking forwards to your reply. Submitted by gum  on Sat, 2007-06-30 17:25. Depending on which publisher you're trying to get in touch with, I recommend you look for contact information on the website of said publisher. Submitted by Isaac Alexander (not verified) on Sat, 2007-06-30 16:30. I forgot to include a mention of this magazine out of the UK. Submitted by Claude J Pelletier (not verified) on Tue, 2007-10-23 15:23. For the coverage of Protoculture Addicts you list only North America, but a great majority of the titles we cover have not been released at the moment of publication. Some are eventually released later in North America, but many of the titles we cover are never released here, so I'd say that we cover also Japan. Some of our news are also Japan related. Submitted by ahmad (not verified) on Sun, 2008-01-27 16:39.
anyone can help me to find these magazines ?? i wanna buy one or to .. and give is as a gift fot my friend his birthday in february 29 .. soon..
anyone can tell me where could i buy these magazines !! Submitted by hollywood night life (not verified) on Sun, 2008-01-27 16:49. Submitted by steve barnum (not verified) on Fri, 2008-02-08 11:10. I'm a big comic book collector and since everybody knows about my passion this year my friends decided to make me happy by putting up a party where all the artificial Christmas trees  were dressed with mangas instead of traditional things. It was my best Christmas ever. I'll submit some pictures as soon as I can. Submitted by Ringogaara (not verified) on Fri, 2008-03-14 03:33. Hi! this is ringo from the philippines. I am a big fan of anime and manga. I had a dream of being a mangaka myself but I had to give up that one because of some reasons. Still, I am a huge anime fan. I am planning to work in a publishing house in the philippines that specializes in publishing mangas. I just want to know if you know a list of those? Thank you very much!